Gamers have suspected that the company Valve is developing an unannounced role-playing game on the engine, Source 2. One player unexpectedly stumbled on trails leading to the mysterious design studio. As it became known on Reddit user under the nickname stiflercosmin, his attention was drawn to the list of friends in the Steam, which was listed as one of the company's employees. He stayed in the game, but did not specify what kind. It seemed strange gamer, so he decided to find out what was happening and went to the hub, which brought him to the project number in the Steam DB data. 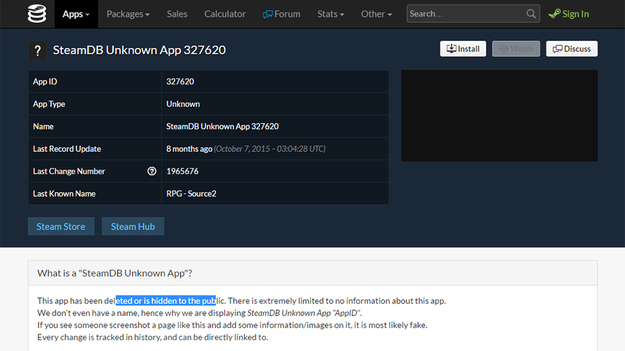 What isa "SteamDB Unknown App"? This app has been deleted or is hidden to the public. There is extremely limited to no information about this app. We don't even have a name, hence why we are displaying StormDB Unknown App "AppID". If you see someone screenshot a page like this and add some information/images on it. It is most likely fake. Every change is tracked in history and can be directly linked to. According to the game project description, it is likely to be an RPG game and Valve is working on a role-playing game with a mark Source 2. There appeared to be an install button on it, I wonder it downloads anything or not, but it is just my curiosity. Last update information in the database dates back to October 2015. And, as you might guess, the project itself is hidden from the wider audience. Gamers have suggested that the team is working only as of the Half-Life 3 . Sceptical users forum felt that the project is likely is a demo version or a technical prototype, which is unlikely to be a game. Whatever it was, many gamers were intrigued and waiting for the official announcement from Valve games. Hopefully, we will see some Source 2 graphics and announcement in the near future.